Welcome to the worlds greatest guide to Women's Flannel Pajamas. Are you actually looking for Women's Flannel Pajamas? Well, we hope you are because the reality is that you have found our Women's Flannel Pajamas page. In this women's clothing section of the Apparel Search directory, you will find all sorts of interesting information regarding Women's Flannel Pajamas. Apparel Search is a leading guide to fashion, style, clothing, glam and all things relevant to apparel. We hope that you find this Women's Flannel Pajamas page to be helpful. Pajamas are loose-fitting garments worn chiefly for sleeping. However, they are also worn for lounging. 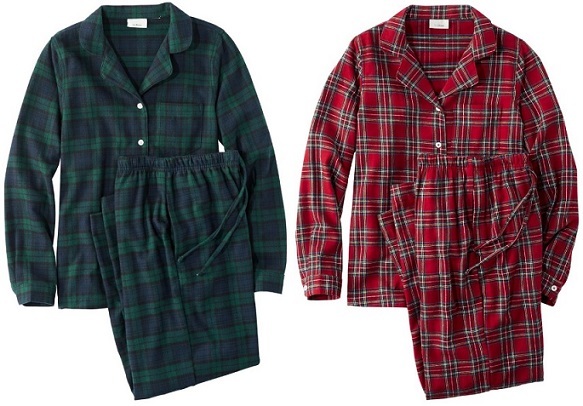 A women's flannel pajama is one that is made from flannel fabric. Flannel is a soft woven fabric, of various fineness. Why are women's flannel pajamas so soft and cozy? Flannel may be brushed to create extra softness. Brushing is a mechanical process wherein a fine metal brush rubs the fabric to raise fine fibers from the loosely spun yarns to form a nap on one side or both sides. Learn more about flannel pajamas. If you want to be even more stylish, you should wear your Women's Flannel Pajamas.